Pearson Audubon member Ann Walter-Fromson participated in an Earth Day celebration at New Garden Gazebo on Saturday, April 23. She gave a presentation on Bird-Friendly Gardening, which was well received by a small but enthusiastic audience. Each participant received the Native Plants for Birds brochure and information about resources regarding native plants at the Audubon North Carolina website. 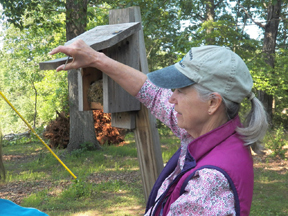 Ann is Pearson Audubon's Bird Friendly Communities Liaison with Audubon NC. On March 5, Ann Walter-Fromson was one of three featured workshop presenters at the Guilford Horticultural Society annual symposium. She spoke to an audience of 50 people about gardening with native plants to benefit birds and other wildlife. Participants received the Native Plants for Birds brochure, a list of area nurseries participating in the Bird-Friendly Native Plants program, and the 2015-2016 lists of Bird-Friendly Native Plants. Many participants had questions about birds they have seen in their yard and about nest boxes for bluebirds and nuthatches. The 2016 Audubon North Carolina Annual Meeting is history. 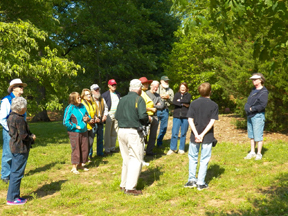 This yearly gathering of Audubon chapters and staff was hosted by Forsyth Audubon, and a great job they did. About 100 chapter members, state office staff, ANC board members, and a few National Audubon staff from Washington, D.C., attended. 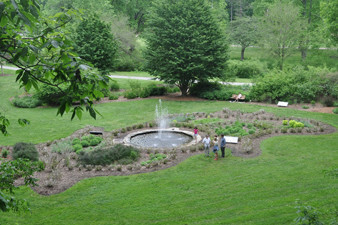 A variety of field trips was offered, such as one to the Blue Ridge Parkway and one to the Emily Allen Wildflower Garden. Workshops were given on the use of native plants for birds and the new Bird of the Year, the Chimney Swift. Heather Hahn held forth on the annual “state of Audubon in North Carolina,” offering us hope despite the anti-environment climate in Raleigh. And Gary Langham, Audubon's chief scientist, discussed the science behind the report on the effect of climate change on North American birds. Of course, great food and libations were available, as well as many great door prizes. In that regard, it turned out that TGPAS had the most members in attendance -- other than the host chapter -- and so each of us got to take home a cute metal bird sculpture. This annual meeting is always a great time. Make a mental note to attend next year. Deepen your knowledge of coastal native plants through artistry and ecology. Audubon North Carolina is opening the gates of its private Sanctuary in Corolla for a special artist retreat. For $250, you can spend the weekend exploring the private Donal C. O’Brien Jr. Sanctuary drawing native botanicals, developing your own native plant landscape design, and learning about the ecology of coastal native plants. Don’t miss your opportunity to spend a weekend with local Outer Banks naturalists at the pristine Sanctuary in Corolla. Click bit.ly/sanctuarynativeplants to learn more about Pine Island. Click https://www.eventbrite.com/e/the-art-and-ecology-of-native-plants-drawing-the-natural-connections-tickets-24970429226 to complete your registration. It seems as if chapter members have very few chances to really get to know one another. And of course new and recently joined members have had even fewer. So here is a good opportunity: Light refreshments and non-alcoholic beverages will be provided by TGPAS at our first Audubon Meet & Greet at 2 p.m., Sunday, Aug. 14, at Scuppernong Books, 304 S Elm St., in downtown Greensboro. You provide the conversation. Please plan to join us for this summer gathering and get to know fellow Audubon members a bit better. More details later, but please mark your calendars. Audubon North Carolina is responsible for raising all of the funds needed to support Audubon’s work in North Carolina. You can help do good work right here in our state by donating to Audubon North Carolina. Most of the state organization's donations come from individuals like you, and every dollar donated directly to Audubon North Carolina goes to work in our state. Donors of $1,000 and above become members of the T. Gilbert Pearson Society (not to be confused with the name of our local chapter, T. Gilbert Pearson Audubon Society). The state's T. Gilbert Pearson Society donors are among the most generous supporters of Audubon North Carolina. You can add to this remarkable group of generous donors in several ways. Your donation can be made in a one-time payment, gifts of stock, or monthly donations of $85 for one year made through the Cardinal Club. The Cardinal Club puts your contribution to work for birds every day of the year. Your tax-deductible monthly gift supports all of Audubon’s programs in North Carolina. The Pearson Society in particular is vital to the financial support of Audubon North Carolina, typically giving up to 85% of its contributed income each year. The state Audubon recognizes the extraordinary commitment of its Pearson Society members and considers them to be major stakeholders in the organization. As such, donors hear from Audubon North Carolina from time to time regarding their perceptions and advice on what Audubon is accomplishing in North Carolina. Specific benefits of membership in the Pearson Society include recognition as a Pearson Society member in annual donor publications, invitations to members-only outings and an exclusive Pearson Society annual weekend, and signature Pearson Society recognition gift. Click here to find out more, or click here to join! Contact Karen Fernandez, Director of Development and Communications at kfernandez@audubon.org with any questions. Pearson Audubon will have an important meeting, its annual planning meeting and officer elections, from 2 to 5 p.m. on Sunday, June 5, at the KCE Family Branch Library in Price Park, our usual indoor meeting place. We are at a critical juncture because several members of the board are rotating off, including both of the co-chairs. Many hands are here to help you step up for your Audubon chapter. Reach out and see how enriching this experience can be. We need as many members as possible to show up and speak out about the direction you want our Audubon chapter to take. Your input makes us the dynamic chapter that so many of you enjoy. Our chapter is as vibrant as its membership. Help us move forward. This also is your chance to help us to explore what you want to explore! Suggest places to go, topics to delve into, and types of nature for us to put into focus for you, your family, and our community. If you’d like to propose some places for our nature walks this summer or throughout the year, or if you have a really cool idea or hot-button issue for one of our regular meetings, please come to the annual meeting or send us an e-mail with your ideas. We will keep in touch with you via e-mail, our website and Facebook. Please take the time June 5 to attend this special Pearson Audubon meeting. Carpool: Meet at 1:45 p.m. at the Whole Foods parking area in Friendly Center between Chick-fil-A and BB&T near the Sears Plaza sign facing Friendly Avenue. Take a walk through history as you walk through this important park at UNCG. The forest where Peabody Park and UNCG's campus now exist was occupied by Confederate Gen. Joe Johnston's army in 1865 just before he surrendered all remaining troops to Union Gen. William Sherman, effectively ending the Civil War. Musket balls and uniform buttons are still found here when working in the woods. Although dorms and other buildings have been built on the edge of the original park and some of the park has been converted to grass, it still offers plenty that is natural and interesting. Four branches of North Buffalo Creek are found here, two in the park woods and two in the fields. The university has built a foot bridge through the woods allowing walkers to look straight into the mature hardwood trees and down on the forest floor. A paved walking path through the park fields invites walkers to amble alongside one of the creeks to look and listen for early summer birds and other critters. A small area of the fields has been converted into a Piedmont prairie by UNCG students and faculty, and a wetland is to be constructed there to help mitigate runoff from the UNCG playing fields. We will take our time on this easy, mostly paved, walk to soak in the sights and sounds of this urban forest and fields. We'll not look for anything in particular but just enjoy the afternoon and nature's late spring offerings. Please join us for this Second Sunday Nature Walk in this historic park. We will gather at 1:45 p.m. at the Whole Foods parking area in Friendly Center between Chick-fil-A and BB&T near the Sears Plaza sign to carpool to UNCG. Join us to walk where Pearson and his students did more than a hundred years ago, still gathering that “intelligent appreciation of nature." Ten of us explored the Pollinator Garden at the Guilford County Extension Center on Sunday, May 8, and then went to the Greensboro Arboretum to see the new Monarch Waystation. Early May was a bit early to see all the plants in bloom, of course, but we enjoyed seeing the design and layout of the gardens and garden structures. Our field trip was planned for this month to coincide with our Thursday evening program in May on bees and other pollinators. The Pollinator Garden is a project of the Guilford County Extension Master Gardeners. It’s a part of the Legacy Demonstration Garden. We saw many plant beds that have nectar plants to attract our native pollinators such as bees and butterflies. 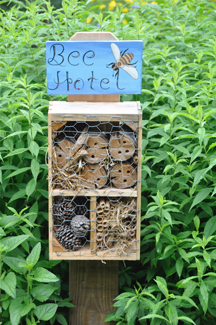 It even features a “bee hotel” made of bamboo tubes, drilled wood blocks, and other materials for solitary bees that nest in such holes. We found that the Butterfly Garden at the Greensboro Arboretum currently is under renovation. The main part of the garden, which is shaped like two butterflies around a central fountain, has had the hedge cut back and new plants are being installed. On the side closest to the paved walking path, a new feature called a Monarch Waystation has just been completed including a new information sign about these threatened butterflies. It features plants specifically intended for Monarch butterflies, including several different species of milkweeds for the caterpillars to eat and nectar-producing flowers that are attractive to adult Monarchs. While we were on our May Second Sunday Nature Walk, we saw honeybees, several species of native bees such as bumblebees, and at least seven species of butterflies. In addition, we had a very good look at an Eastern Phoebe that posed for us nearby, as well as other common species of birds. Both of these sites are well worth a visit later this season when the plants will be fully in bloom. 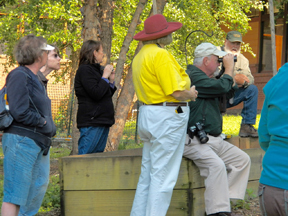 On May 15 we held the third of three workshops in our very popular series of Beginning Birder Workshops for 2015-2016. The topic for each workshop has been different for different aspects of birding. The topic this time was “Attracting Birds to Your Back Yard” and focused on bird feeding, bird feeders, and using bird-friendly plants in our home landscapes. We had 24 participants for this one. The workshops each included a 45-minute classroom presentation and discussion followed by 45 minutes of watching feeders and looking for birds outdoors. Each has been at the Kathleen Clay Edwards Family Branch Library in Price Park. It was co-sponsored by T. Gilbert Pearson Audubon Society and Piedmont Bird Club and led by Dennis Burnette, who is active in both organizations. We have had good publicity through the library and the Greensboro newspaper, as well as our organizational websites, Facebook pages, and the TGPAS newsletter. Approximately 100 people have joined us for our three workshops, which we consider excellent outreach to the community. For this last workshop in the series, we were fortunate to have Stella Wear (pictured at right) who also is active in both TGPAS and PBC. She is our local expert on Brown-headed Nuthatch nesting boxes. She showed us a box with a nest that had been installed behind the library and explained the Audubon North Carolina project through which these declining birds are being helped and monitored. Experienced members of TGPAS and PBC have assisted with each of the three workshops as mentors. They helped participants find and identify the birds we were watching, gave tips on using binoculars, and answered questions about birds and birding. We appreciate the help in this May workship of Dennis Burnette, Lynn Burnette, Stella Wear, Tom Wear, Gregg Morris, Julien McCarthy, and Emily Tyler. We also thank Fiona Meisner for being our photographer for this session; three of her great photos accompany this report.